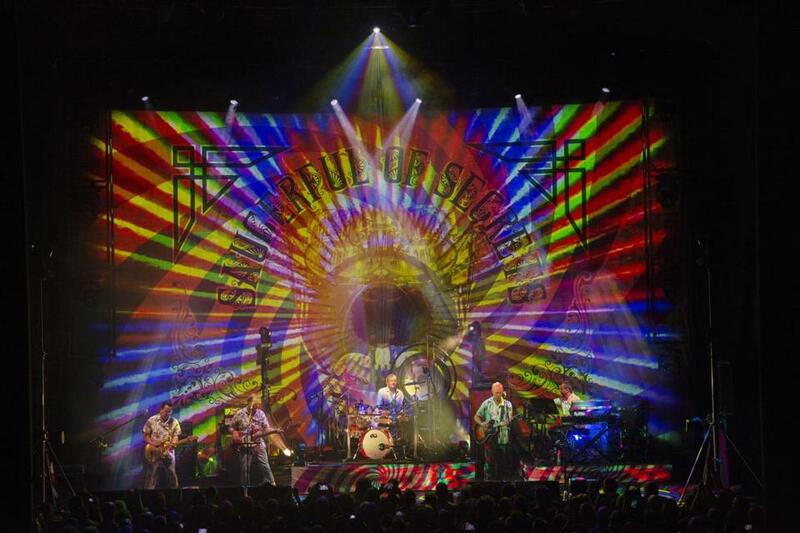 Nick Mason&apos;s Saucerful of Secrets in London last year. Humble, dry-witted drummer Nick Mason is the only member of Pink Floyd to have played on all of their albums. He was there at the inception of progressive rock and is still on good terms with estranged Pink Floyd bandmates Roger Waters and David Gilmour. Rather than wait for them to revive the band, Mason has started a new group called Nick Mason’s Saucerful of Secrets, which headlines the Orpheum Theatre Saturday. The group digs into the early Floyd catalog, notably the band’s first two albums, “The Piper at the Gates of Dawn” and “A Saucerful of Secrets.” Those were from the days when Syd Barrett fronted the group before reportedly becoming a famous LSD casualty. He grew unreliable and was eventually dropped from the band. Speaking by phone from England, Mason tackles a number of subjects (including Barrett, who died in 2006), but he is mostly just glad to be back on tour with an unusual cross-section of musicians, including Spandau Ballet guitarist Gary Kemp. Q. I met you once when you played in the stadium outside of Boston in 1994 on the last Pink Floyd tour. You said you hoped Pink Floyd would tour more often. A. It’s only been 25 years. These things take time! Q. Is it a regret, though? Are you sad there wasn’t another Floyd tour? A. Yeah, I definitely feel it was sad we didn’t, but it just wasn’t going to happen, not with Roger and David anyway. Roger is off on his own beat, and I can’t see why he’d want to go back to something from the past particularly. Now we have a bit of our own history without him, and I think that makes it even more difficult. It’s hard to see how it could really work. Q. With your band Saucerful of Secrets you’re doing a lot of early Floyd material, from the late ’60s into the ’70s. What is your motivation for that, because obviously you’re getting into Syd Barrett territory? A. Absolutely. I think one thing is that the rest of the band have great affection for the songs from that era. And so do I. And the world doesn’t really need another Pink Floyd best-of-hits tribute band. There’s the Australian Pink Floyd, the British Pink Floyd . . . there are so many other bands doing a version of “Comfortably Numb” as accurately as they can. So I’m looking for something a bit freer. Q. You’re doing lots of early Syd tunes such as “See Emily Play” and “Arnold Layne.” What’s it like revisiting those songs? A. It’s really fun. We try to play them pretty close to the way they were recorded, but it inevitably has a different feel. We’re not trying to replicate them exactly. We’re just using it as a template for the song. And actually it’s really nice like that because you’re not slavishly trying to do the same thing. You just enjoy the playing of it. And for me, it’s absolutely like a time machine some of the time. It’s a guide back 50-odd years. Q. With all that has been said and written about Syd, so much is made of the drug-casualty side of him. Can you share some positive stories? How good was he at the beginning? A. Well, it is a sad story. I’ll get back to the positive side, but I think one of the things is we’re still to some extent dealing with the loss of Syd. No one knows really exactly what went wrong — and we really had no idea with how to deal with what was going wrong. And so I think we’re still interested in what really happened. And on the positive side, we wouldn’t be here now if it wasn’t for Syd. He absolutely built the band initially. He was the front of it. He was the writer and the main man. He produced the singles that got us launched and gave us a record deal. Q. And didn’t he name the band, too? A. Yes, he was a one-stop shop. Q. As a musician, that playful, almost fairy tale side of Syd — that music seemed to come out of nowhere. It was so unique. A. Yes and no. There was certainly a school of that slightly bucolic, English-country side of Syd, but the amazing thing is that he could move between a couple of genres. Because something like the really more extreme “Interstellar Overdrive” or “Astronomy Domine” have a very different feel to that slightly folkie thing that was maybe mindful of Fairport Convention or the Incredible String Band or something like that. Q. Going back to the ’60s and the UFO Club (in London) where you played, how much acid was really done back then? A. Not as much as people think. Certainly from our point of view, seeing what happened to Syd seems very much triggered by acid and possibly by something that I think is now referred to as STP, which was a particularly powerful form. It was enough to put quite a lot of people off. The curious thing is now with all these “recreational” drugs. In the ’60s it was seen as much more of a serious event. The idea would be that you’d have a guide who would be with you to get you through the experience. But I think it was a lot more talked-about than actually done. Q. Well, you’re still here at 75 years old and kicking pretty well. You survived. Q. How did you come up with the name of Saucerful of Secrets for the band? A. I think there was a wish to try to say something about what we do immediately, to stop people from thinking we were going to do Floyd hits of the last 40 years or whatever. And to me, [“Saucerful of Secrets”] is one of my favorite albums anyway. Q. The last couple of nights I played “Saucerful of Secrets” and that’s like music from another planet by contemporary standards. Do you feel that way? A. Yeah, because I think [first album] “The Piper at the Gates of Dawn” was made very much as a sort of classic rock album, as a number of tracks are all about the same length. It was relatively groundbreaking but it was sort of up against “Sgt. Pepper’s” really, which was being made down the corridor from what we were doing at Abbey Road Studio. And that seemed so much more advanced. But when we get to “Saucerful,” it’s far more experimental, I think. Q. Tell me about the band. You have some really good players like Spandau Ballet guitarist Gary Kemp and guitarist Lee Harris. How did you put it together? A. The guy who pushed for this initially is Lee Harris, who is a friend of [bassist] Guy Pratt’s. And Lee was with the Blockheads with Ian Dury. And Lee talked to Guy about it. Guy I’ve worked with for the last 30-odd years. When Guy thought it was a great idea, that tipped me into it because I have great faith in Guy. He’s a terrific player who has played with everyone. He has played on a Michael Jackson track and with Madonna. So there was a great sense of confidence when he thought we could do it. Q. Have David and Roger from Pink Floyd given you their blessing? A. Yes, both of them. They haven’t been to see us but they have clearly viewed every detail on YouTube! David was helpful in loaning equipment, and Roger threatened to come down and do a guest spot, but he hasn’t managed that yet. But you never know. Q. One question about your drumming. You’ve been underrated compared in those days to John Bonham, Keith Moon, and so forth. How do you see yourself as fitting into the whole drum repertoire through the years? Does it upset you that you’ve been a little underrated? A. Not, not at all, actually. In a way, I’m rather gratified when people do like reviewing the drumming now and going back and looking at it. I think what I do is right for the band. I’m not a great technical player. I’m not that sort of heavyweight like the Bonhams or Keith Moons or Ginger Bakers. I’m very happy with the role that I have, which is to be part of the band rather than the feature of it. I’m a great fan of Ringo Starr because I think if you can be the right drummer for the band, then you’ll take the job. Q. That’s also like Charlie Watts of the Stones. A. Yes, absolutely! A perfect example.